RIO DE JANEIRO, BRAZIL -- Michael Phelps won his 20th and 21st gold medals on Tuesday, pulling even further ahead in his position as the all-time most decorated Olympic athlete. 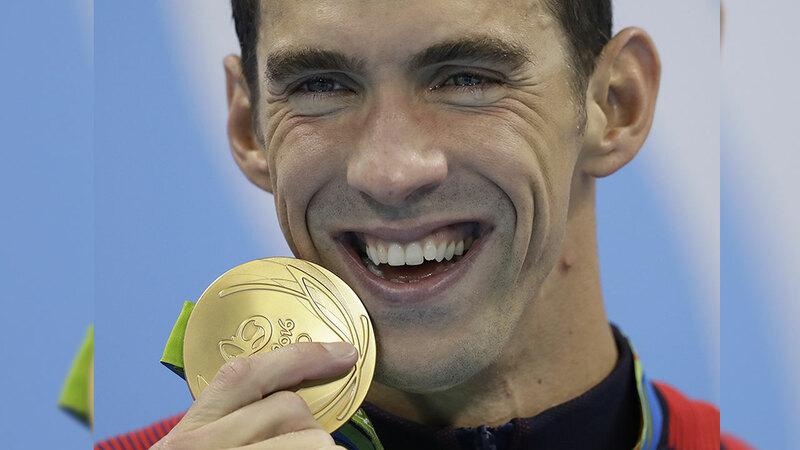 Phelps won his latest gold as part of the U.S. 4x200-meter freestyle relay team. Phelps now has 25 Olympic medals in total, in a career that dates back to the 2000 Olympics, when at age 15 he become the youngest male to make a U.S. swimming team in decades. The next-highest all-time medal record goes to USSR gymnast Larisa Latynina who won 9 gold and 18 overall medals in the 1950s and '60s. Earlier in the day, Phelps picked up his 20th in the 200-meter butterfly. In that earlier event, Phelps made up for one of the few losses in his staggering career, by holding off Japan's Masato Sakai by a mere four-hundredths of a second. The winning time was 1 minute, 53.36 seconds, but that was of little concern. The only thing that mattered was getting to the wall first. Phelps retired after the London Games, so it looked like he wouldn't get a chance to make up for his defeat. But when he decided about a year later to start competing again, the 200 fly was clearly the title he wanted more than any other. In what was shaping up to be another very good night for the Americans, Katie Ledecky took the most challenging step toward a feat that's only been done one other time. Ledecky held off Sweden's Sarah Sjostrom to win the 200 freestyle and give the American star her second gold of the Rio Games. Debbie Meyer is the only female swimmer to capture the three longest freestyle events at a single Olympics, winning the 200, 400 and 800 at Mexico City in 1968. Ledecky looks like a lock to match Meyer, having already won the 200 and 400 titles and an overwhelming favorite in the 800, where she's the world-record holder and far faster than anyone else in the world. "That was a really tough race and it hurt really badly," Ledecky said. "I'm pretty sure it's the closest I've come to throwing up in the middle of a race. I'm just so glad I got my hand on the wall first and it was all worth it." The 200 may be the shortest race of the bunch but it's definitely the hardest for Ledecky, requiring her to show both her speed and endurance against a far more competitive field. "The 200 is a much more stressful race than the 400 and 800, and it always just feels good when it's over," she said. "I took it out pretty fast and kind of forced everybody to try to do that. Once I was ahead I knew I wasn't going to let it out of my hands. I knew I wasn't going to be able to see most of the field on the last 50, so I just had to dig deep." Phelps hustled off the deck after his victory celebration, having only about an hour to get ready for his second race of the night - anchoring the U.S. in the 4x200 freestyle relay. Conor Dywer was leading off for the Americans, followed by Townley Haas and 11-time Olympic medalist Ryan Lochte, competing in his first event of these games. Phelps was picked to finish up, eventually claiming gold medal No. 21.